For more modern interiors, choose from our range of contemporary skirting board designs to finish your room off in style. The current trend is towards more simplistic designs with minimal detailing. Right now, skirting boards that feature a single or double groove are particularly popular. 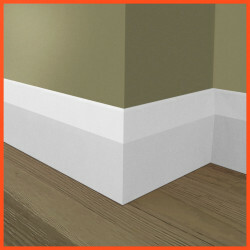 Contemporary skirting boards are generally shorter than more traditional styles- they tend to be ordered within the 95mm-145mm range, though it is not uncommon to opt for a higher board if the room requires. There has been a real shift in the type of finish associated with modern skirting boards. Overwhelmingly, people are choosing a satin paint finish where in the past gloss was by far the more widely used finish. In addition, we have noticed an increase in the number of customers moving away from white paint, and requesting that their skirting boards be finished in an alternative colour. At Skirting 4 U, we are able to supply pre painted skirting boards in any RAL colour (a small additional fee may be payable for this service). If you have a particular colour or finish you require, please speak to our sales team to make arrangements for this.